It is Carnevale time in Italy! 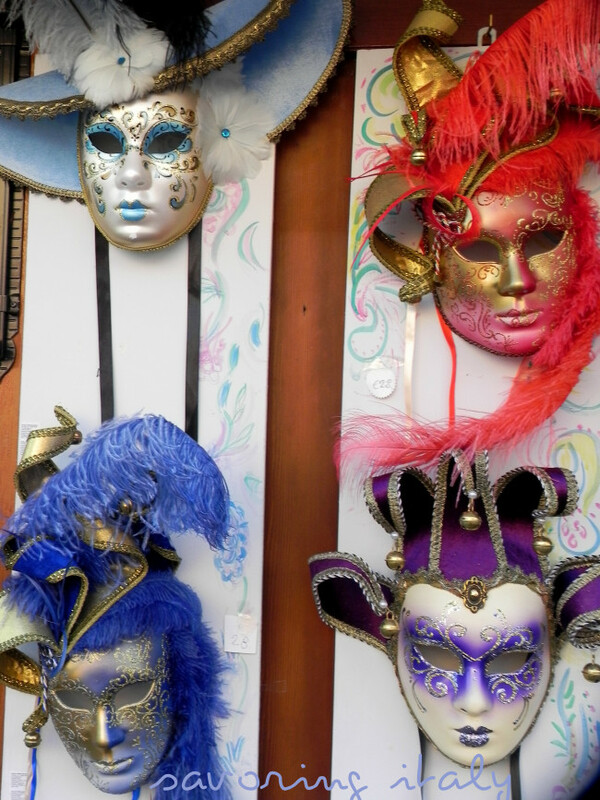 Carnevale in Italy is what is most commonly known in America as mardi gras. Carnevale is celebrated in Italy and in many countries all over the world the 40 days before Easter. Carnevale is the the big party before Ash Wednesday and Lent. It happens to be Italy’s biggest festival and lasts for weeks! Chiacchere is actually one of my favorite Italian words. It means, “chit-chat”, or better yet, “gossip”. It’s a funny name given to something that is not that hard to make and is so good to eat Depending on which part of Italy you are in, they may be called: crostoli, cenci, bugie, cioffe, sfrappole, fiochetti, frappe, and even galani. My Calabrian in-laws do call them chiacchere. It is a sweet treat that goes back to the days of the ancient Romans and they were called frictilia. Frictilia were enjoyed in ancient Roman days to celebrate the end of winter. 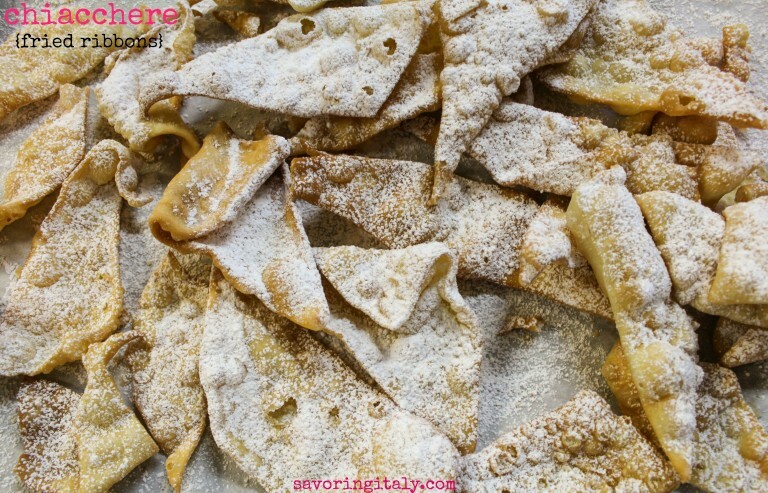 They made their dough by frying in in pork fat and they made a lot of them, with the goal of having them last untiDuring the same months in which Carnevale is celebrated today, Romans used to prepare frictilia to celebrate the end of winter. 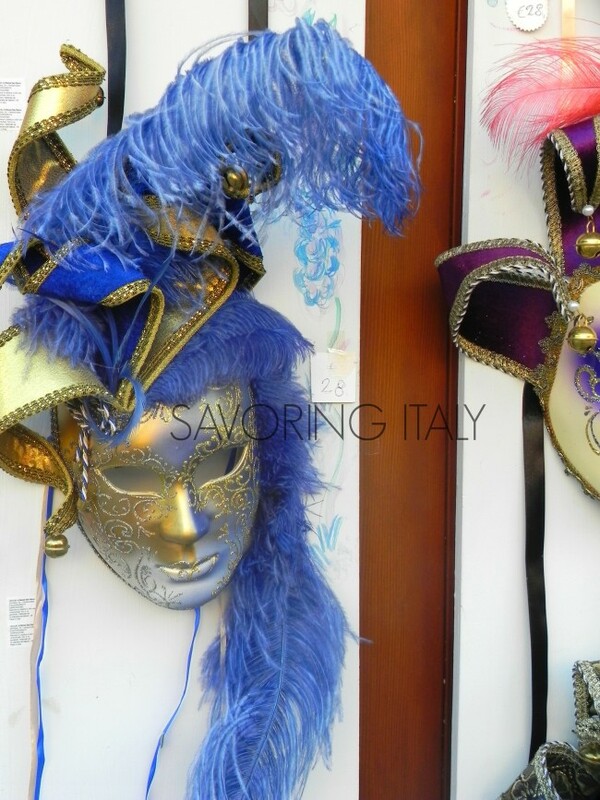 These are beautiful masks I saw in Venice this summer…the colors are gorgeous!!! 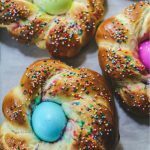 Although they are typically prepared for Carnevale they are also commonly served at Christmas, Easter and special occasions like baptisms and weddings. Carnevale is not only a time to celebrate and is a festival that last weeks, but also a time to enjoy amazing food. During the carnival in Umbria, for instance you may taste struffoli, a sweet typical of Perugia, made with honey, sugar and candied fruits. 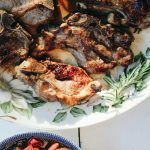 The cicerchiata is another typical Umbrian recipe. Like struffoli, cicerchiata is a traditional Umbrian sweet, but has been wrongly considered Abruzzian for a long time. 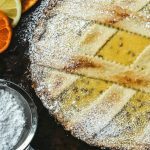 It is made with small dough balls, dipped in orange honey and garnished with candied fruit and sugared almonds. Carnevale is celebrated all over beautiful Italy, but there are some cities that have very special celebrations: Cento, Viareggio, Venice. In those cities you will find the more elaborate festivities. Verona has the Bacanal del Gnoco, a party that is from the time of the Middle Ages! Some sweets you will find in Italy (besides Chiacchere): fritelle-fried dough made with apples that is rolled in sugar as soon as they’re ready. I happen to really love the chiacchere (also known with several regional names, from frappe to bugie), light puff pastry deep fried and covered in confectioner’s sugar, often filled with jam or chocolate. 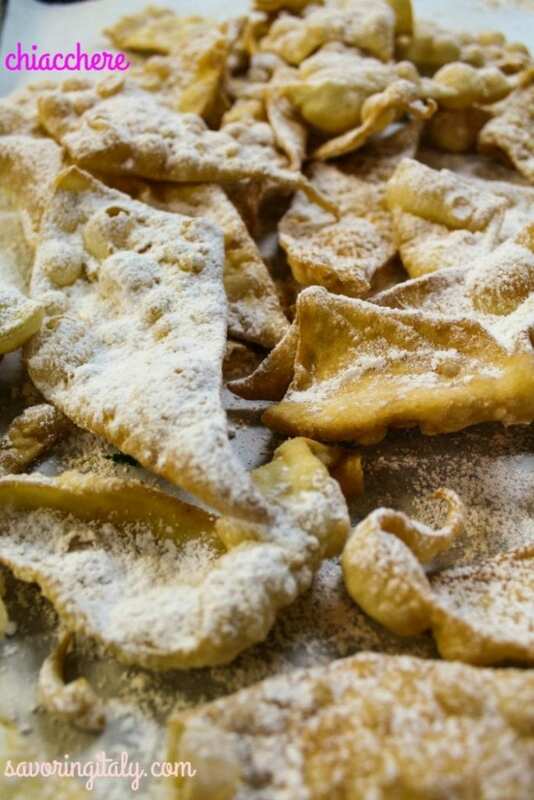 Another treat popular during carnevale time are the castagnole. 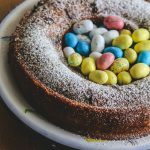 They are made with flour, eggs, butter and sugar, and deep fried. Castagnole, like chiacchere, are often filled with custard or cream. After the puffs of dough are deep friend they are then tossed in confectioner’s sugar. Are you hungry yet?!? I prepared these by hand using a rolling pin and rolling the dough quite thin can be a bit of a workout but you can also roll the pastry dough with a pasta machine. 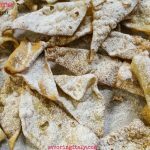 Along with the various given names these sweet fried pastry strips are also cut and shaped in various ways, squares, rectangles, diamonds, thin strips tied in loose knots and of course, the bow shape that I’ve prepared. Don’t say I didn’t warn you that no matter what you size you make them, or what you call them, chiacchiere are totally irresistible!! Go ahead and try one! You will find that that first one will be the start of something delicious and dangerous! Impossible to eat only one! 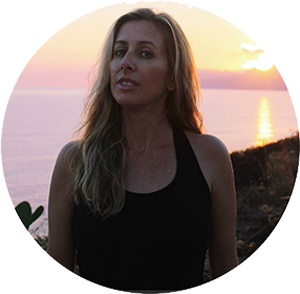 I love the shape of this one from Labna. A typical Italian fried treat enjoyed during the holidays. Chiacchere are found in different places in Italy during the famous Carnevale festivities! In bowl of stand mixer fitted with paddle attachment, beat egg and egg yolk with the sugar at medium speed until pale in color. Add the sugar, salt, olive oil and dry white wine; beat until combined. Slowly add in the flour a little bit at a time and mix on low speed until combined. Remove the dough from the mixer and place on a clean counter. Begin kneading the dough. Add more flour a little at a time if it is too sticky. Knead for about 8-10 minutes until smooth and elastic. Cut dough into 4 pieces and cover in plastic wrap. Chill dough for about one hour. When dough is ready to work with, take out the first portion from the refrigerator. Roll out the dough on a lightly floured surface (counter or pastry board)to a thickness of about 1/8 inch. Using fluted pastry wheel, cut your dough into long strips, 3 to 4cm (1.5in) wide and then cut every strip into 10cm (4in) rectangles. Continue rolling and cutting the rest of the dough. Line rimmed baking sheet with three layers of paper towels (to drain excess oil). Fill deep saucepan with oil; heat oil over high heat. Reduce the heat to medium and fry them a few at a time. Fry until lightly golden one one side, then carefully flip over and fry the other side until lightly golden. Remove the pastry strips with slotted spoon and drain on paper towel lined cookie sheet.